Thanks to y'all getting my wheels turning, I made up some cards with the rubber stamps this morning. 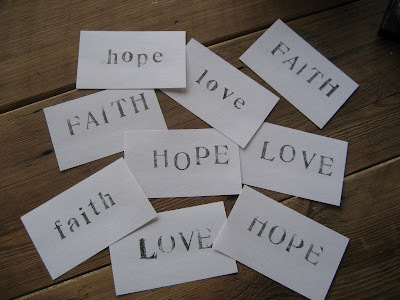 If you are unaware, there is an art to using stamps! I am finding that rolling the stamp is pretty effective. Of course, you all knew this. But, I'm learning as I go. See? I had to double some of the letters, after making them a little too light, or missing parts. Probably should just ditch those cards. But, I had to show you my efforts. Yes. I am keeping the stamps. To those of you who offered to take them off my hands, I thank you. I am discovering the fun of stamps! Look out world! 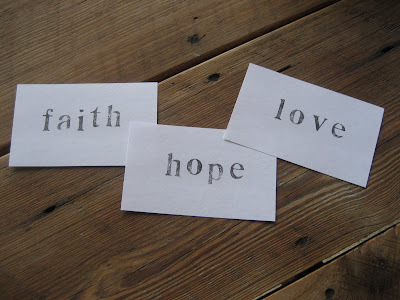 Faith, hope and love. Let's show some love and offer up some prayers for Debbie at Talking Trash. Her daughter, Jennifer, is currently in the hospital, pregnant and diagnosed with preeclampsia. Jennifer is not due to deliver until July. Let's keep the family and medical professionals in our prayers. Swing on over to Debbie's blog and give her a hug. Theresa has updates if you would like to check in with her. Great verse, baby! And I like the cards! You are so right about this blog world, we can all be there for each other when we need to be!! Lurch and I are sending up prayers! Glad you decided to keep the stamps, they are a lot of fun to play with. When I hear about the things going on in other peoples lives it makes my problems seem so small. I'll be praying for Deb's daughter! Hi Mindy...thanks so much for stopping by and leaving a kind message for me. 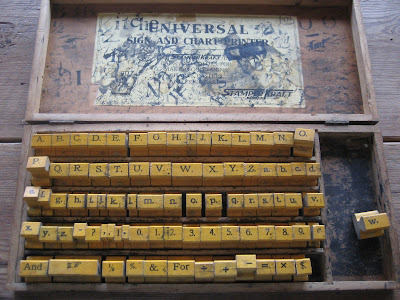 Those are beautiful old stamps. Best thoughts going out to Jennifer and her little bundle. I've decided that I'm going to jump onboard with the latest, greatest way to share junk and have an ONLINE GARAGE SALE! Thanks Margo and Mindy for this great idea and it sounds like a lot of fun! So This Sat and Sun, check out my blog: www.rustandsplinters.blogspot.com for some great bargains! Spread the word and be sure and say hello!!! That stamp set is an amazing find - I'm glad you're keeping it. It will be a lot of fun to play with. 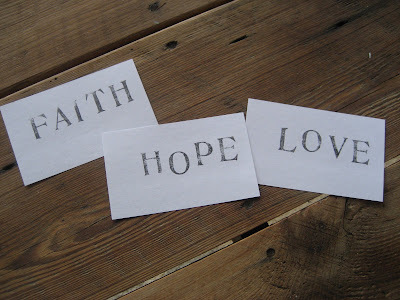 I appreciate your "faith, hope, love" message, and I'm sure Debbie and family do as well at this time.